SACRAMENTO, Calif. /California Newswire/ — Today, Calif. 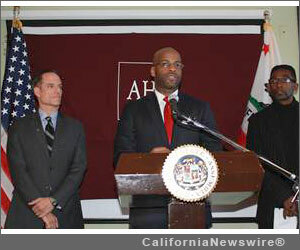 Senator Isadore Hall, III (D – South Bay) introduced Senate Resolution 39 (Hall) that publicly condemns Republican Presidential candidate Donald Trump and Republican Presidential candidate Ted Cruz for their recent racist remarks against immigrant families and calls upon the State of California to divest any business relationships with Donald Trump, the Trump Organization or any of his affiliated business entities. The resolution also encourages private businesses and individuals throughout California to end all business ties with Donald Trump, the Trump Organization or any of his affiliated business entities. Mr. Trump recently created a firestorm of outrage across the country when he stated that, “When Mexico sends its people, they’re not sending their best. They’re sending people that have lots of problems, and they’re bringing those problems with us. They’re bringing drugs. They’re bringing crime. They’re bringing rapists.” Fellow Republican Presidential candidate Senator Ted Cruz (R – Texas) instead of condemning these comments defended Trump’s statement and followed Cruz’s own previous comments attacking undocumented immigrants. California is home to the largest population of immigrants in the United States, whose contributions help to drive this state to be the most economically successful and prosperous in the nation. A recent study by the University of California, Los Angeles, found that legalizing the status of undocumented immigrants working and living in the United States would create approximately $1.5 trillion in additional gross domestic product growth over the next 10 years and increase wages for all workers. Companies throughout the nation quickly responded to Trump’s comments by ending their business relationship with him including NBC Universal, ESPN and the Professional Golf Association. Joined by nine Senate co-authors, SR 39 would make California the first state in the nation to publicly call for its government to divest from Trump and encourages the state’s businesses and 38 million residents to join California’s efforts to DUMP TRUMP. Senator Hall will be joined by his Senate colleagues to discuss the introduction of SR 39 on Thursday, July 9, 2015, upon adjournment of Senate Floor Session outside of the State Senate Chambers.